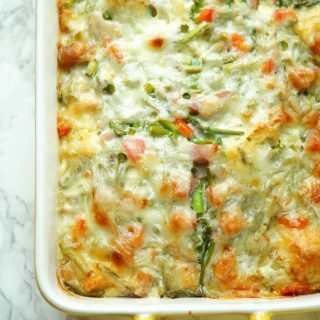 Ham and Asparagus Strata is full of flavor, make ahead, and so simple, which makes it the perfect spring brunch dish! 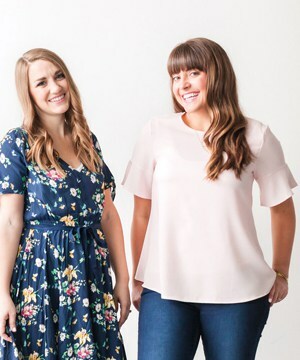 Amanda here from Old House to New Home sharing a recipe that is perfect for your Mother’s Day or Easter Brunch, or just for a delicious weekend breakfast! Quiches and frittatas often steal the brunch spotlight and I think everyone forgets about the just as delicious strata! If you have never had one before, it is basically just an egg bake but with the addition of bread cubes. 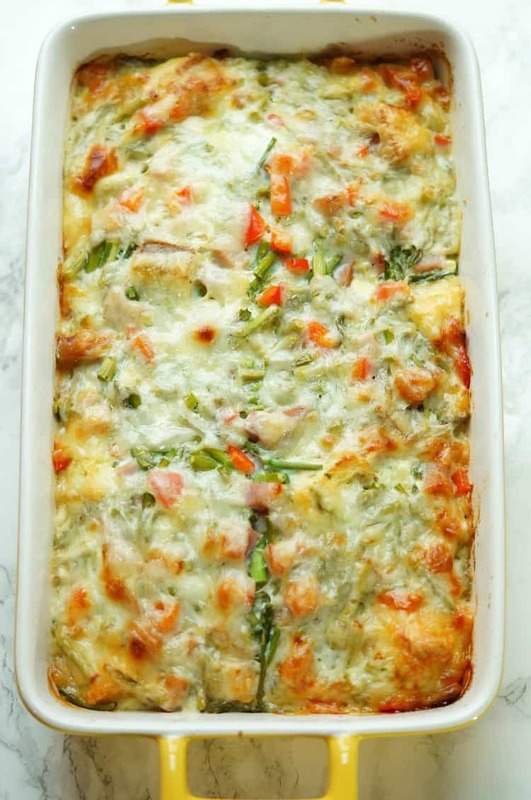 The bread adds a delicious texture to the eggs and makes it more casserole like! I first made this recipe years ago for Christmas morning. It was one our first Christmas morning with a little one at home, so my parents and grandmother came over to open presents with us at our house. I wanted to serve something easy, but delicious, and this recipe definitely fit the bill. While this was perfect for Christmas, I love it even more for spring entertaining. Asparagus is perfect this time of the year and is so good mixed with the eggs and swiss cheese. Asparagus is one of our favorite veggies. I love it roasted then tossed with tomatoes and served with toasted breadcrumbs in one of our favorite pasta dishes! it is so versatile and I have even throw it shaved onto pizza too! 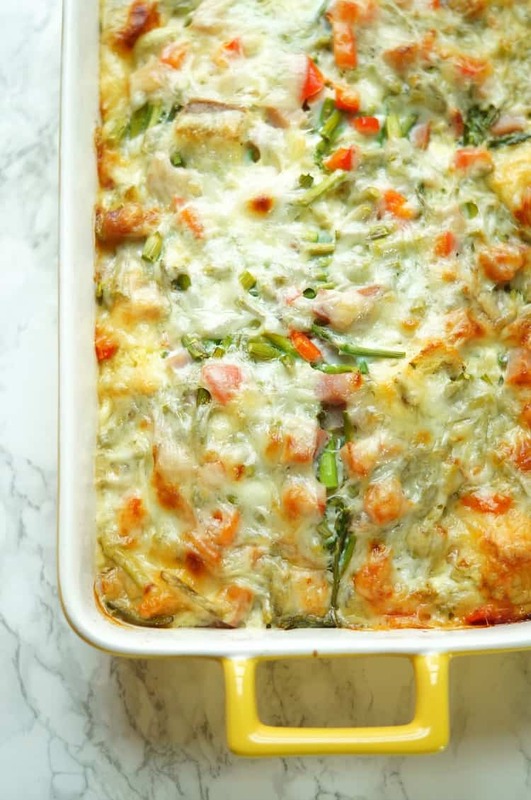 Nothing beats the taste of asparagus though when it is tossed with ham, creamy swiss, and crusty French bread in this strata! This dish definitely makes me look forward to waking up in the morning for breakfast, which is no easy task for me! 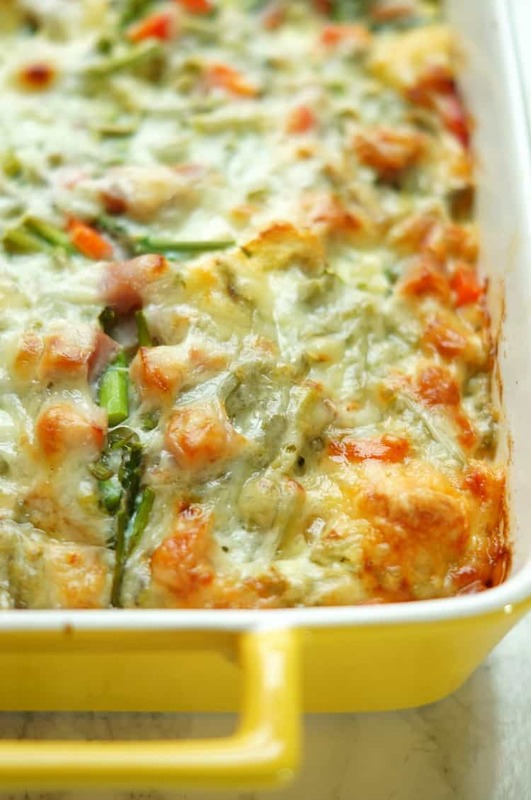 This strata is even more perfect for spring holidays because it can be made the night before. Make ahead breakfasts are the best, especially when you have company coming! 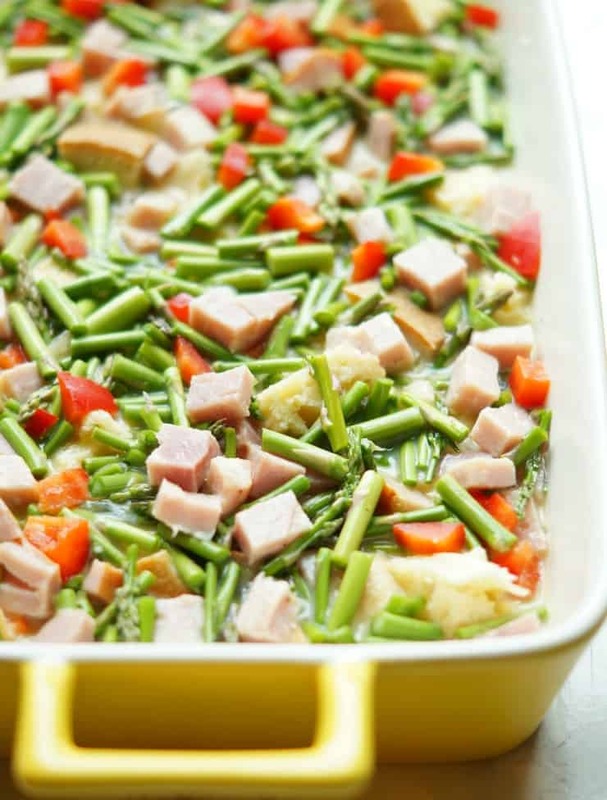 This Ham and Asparagus Strata definitely needs a place on your breakfast or brunch table! 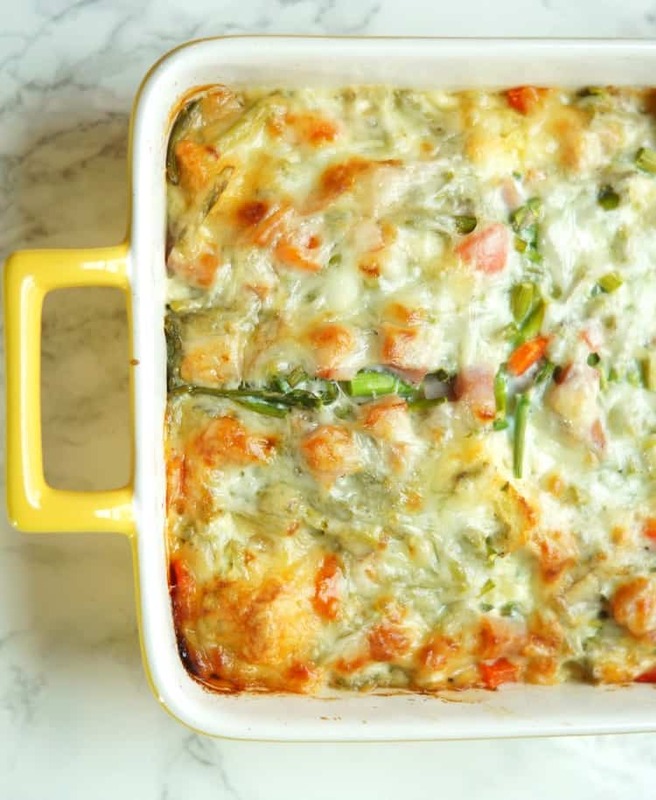 It will become your new go to breakfast casserole! In a mixing bowl, whisk together milk, eggs, salt, and pepper. Pour egg mixture over top of the bread layers. Lay the six slices of cheese over top of the casserole. Cover tightly with foil and refrigerate over night, or for at least two hours. In the morning, preheat oven to 375 degrees. While oven is preheating, set casserole dish on the counter to warm up. Bake for 40-50 minutes, or until a knife inserted in the center comes out clean. Garnish with green onions.